Junior Reign squad headed to Canada. The Bantam B Junior Reign Hockey team won the Silver Stick Regional Championship in San Jose on Sunday, November 27, 2011. As champions, the Jr. Reign will now represent the Pacific District in the Silver Stick International Finals in Pelham, Ontario, Canada from January 5-9, 2012. In order for the team to be able to travel to Canada to compete in the finals, they need your help with donations for transportation, lodging costs, etc. for the team. Any donations, no matter the size, would help this team represent Southern California. IVHA – Jr. Reign Hockey Club is a Non-Profit 501-(c)3 organization. 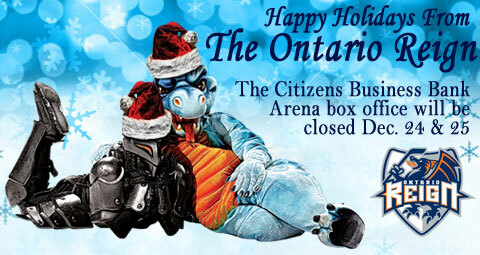 Your donation would be tax deductible. Please contact Jeff Wilhelm, President, at (951) 377-3823 or jwilhelm@jrreign.com. In case you missed the invitation yesterday on Facebook or Twitter, this week’s Ontario Reign newsletter included at least one photo that deserves a funny caption. I thought the second photo was rife for satire, but some people have already submitted caption suggestions for the first. **As a bonus, I’ve been told that the winning caption will be shown on the big video board at the next Reign game. Can’t make a promise on that one, but there’s your added incentive. The Reign kicked off their three-game weekend series in Alaska on Friday down two men and two goals. The Aces walked away with a 3-1 win despite being outshot 34-24. Kevin Estrada scored the Reign’s only goal at 7:41 of the third period. It was his first of the season, his first since the 2009-10 season in Germany, and his first in the ECHL since April 10, 2008 as a member of the Victoria Salmon Kings. That was as close as the Reign would get. Three minutes and one second later, Wes Goldie scored his 12th goal of the season to make it 3-1. Steve Ward and Gary Nunn scored power-play goals in the second period for the Aces (19-4-1-1), who finished 2-for-5 on the power play. The Reign (12-10-1-1) are stuck in sixth place in the Western Conference standings, third in the Pacific Division, and failed to gain ground on the second-place Stockton Thunder, who lost 6-2 to Idaho earlier in the night. Chris Carrozzi stopped 21 of 24 shots. J-F Berube made his first appearance (albeit on the bench) since sustaining a neck injury in practice last month. Forward Matt Tassone (back) did not accompany the Reign on the trip. Shayne Neigum skated at forward, giving the Reign nine forwards and five defensemen. The 14 skaters are two below the ECHL maximum. Chris Cloud gets first AHL call-up. The Reign lost their second forward in three days to the Manchester Monarchs on Wednesday. Left wing Chris Cloud, who leads the team in major penalties, signed a pro tryout contract with the Kings’ American Hockey League affiliate, joining linemate J.D. Watt at the next level. Cloud has five goals, 10 points and 84 penalty minutes this season, appearing in all 22 games. He is tied for second in the ECHL in major penalties with 10. 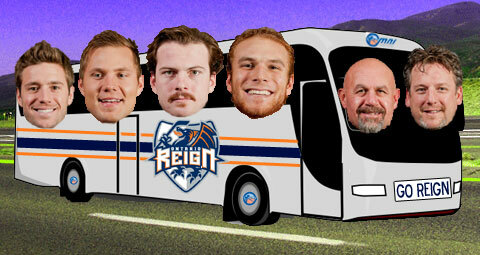 The Monarchs recently lost center Cam Paddock to a four-game suspension, so Cloud and Watt could conceivably return to the Reign soon. Still, it’s quite an opportunity for Cloud, who spent the last two seasons in the Central Hockey League and has never played in the AHL before. The Reign could be without two-thirds of their toughest line Friday in Alaska. Count on Shayne Neigum seeing plenty of time at forward, and Kevin Estrada getting a long look in his debut game, with Bill Bagron centering the line. Chris Carrozzi’s claim to fame. St. John’s, Newfoundland, is more than 4,000 miles away from Ontario, California. To say it’s half a world away is not inaccurate. One thing the two cities happen to have in common is hockey; the St. John’s IceCaps joined the American Hockey League this season, and even briefly employed a Reign player, defenseman Mike Montgomery. Watt recalled, injury updates, other notes from practice. J.D. Watt became the first Reign forward recalled to the American Hockey League on Monday, when the 24-year-old right wing found out mid-practice that he was headed to the Manchester Monarchs. Watt was scheduled to catch his flight east this afternoon. Watt, who came to Ontario on an AHL contract, has seven points (one goal, six assists) and 66 penalty minutes in 22 games this season. What he lacks in skill — his 1.7% shooting accuracy is the lowest among all Reign players with at least 20 shots on goal — he makes up for in controlled aggression. A familiar presence in the opponent’s crease, Watt mostly racked up penalty minutes with his fists, drawing nearly as many minors as he committed. Junior Reign sled hockey update. Our first official season as the Junior Reign Sled Hockey team will kick off at 7:00 PM on Monday, January 9th, 2012! We will be practicing on alternate Monday evenings for now, from 7:00 to 8:30 PM. Our brand-new coach is Dave Davies, a Level 4 Certified USA Hockey coach, who has officially signed on to lead our team. 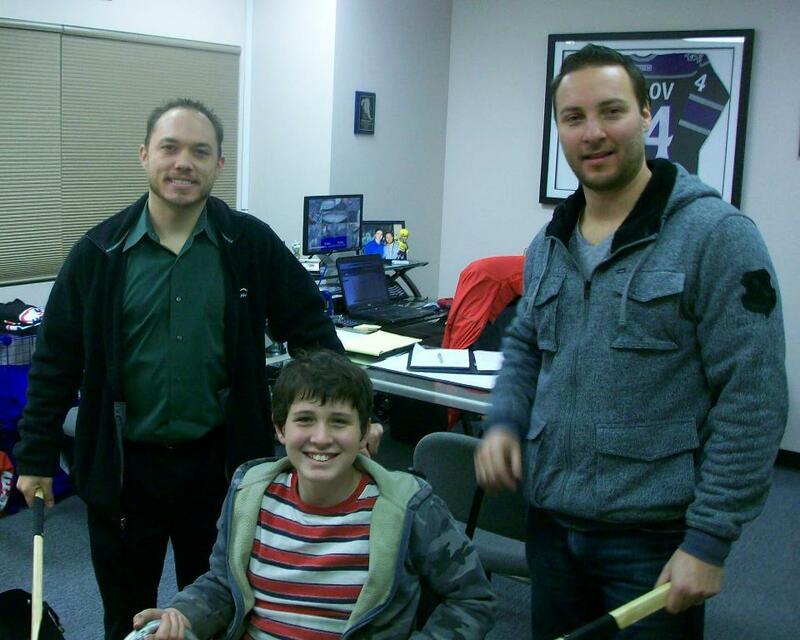 He’s on the left in the photo below with Nicholas [Jenkins] and Matt Dunaev, Icetown’s hockey director. We are happy to have Dave on board, and he is excited to be part of Southern California’s inaugural sled hockey program.